It's been a weird few days, as I swing from exhausted to restless, joyful to sad. I think I'm caught up on sleep! But I miss the excitement of going somewhere new every day. I REALLY miss it. I didn't think I would. I can't say enough what a great trip that was, I LOVED it. But I miss my engraver friends so much. Thank goodness for the internet, eh? :-) I can't wait til the next show (January). I've been invited back to Kansas again this year, in August. I had a great time last year but I just don't think I can swing it this time, I'm pressed for time already between now and September, and already have a couple weekends taken by a wedding and then a family reunion. Arg. I'll think about it, but I don't think it'll work for me to go. There are still some odds and ends of luggage strewn around that I haven't quite managed to deal with yet, but it was back to work today. Lots of correspondence to catch up on, price quotes, and sketches. I will be starting work on another knife tomorrow, and I'll tell you more about that later. I have quite a few commissions lined up, but also need to crank out a lot of work for the Western Visions show. It's under three months until I leave for Jackson Hole. I know how quickly three months went by before Blade Show! I have to say I'm excited about another road trip! Yes, I'm going to drive there too. I can get there in two days, and I'll need a car anyway since I plan to spend some time in Yellowstone. I'm still game for taking someone with me... so far no takers and that's okay too. 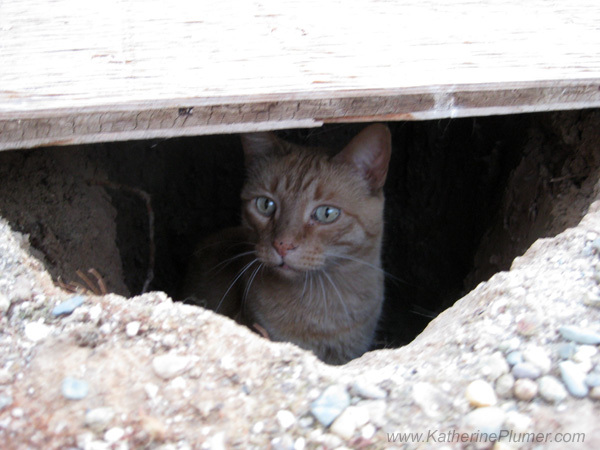 For your entertainment, here's Olin sitting in a hole, probably wondering why a cat can't get any privacy around here. Guess who had to go to the vet while I was in Atlanta... Guess where Olin had a foxtail sticker lodged in his body... think the worst possible place for a boy cat, a place that makes you think "how is that even possible?" Yes, up there, ahem. The vet had never seen that before. My poor little boy!!!!!!!!!!! He's fine now. Criminy, that's just awful!!! What a great trip and your photos are super. I had to laugh when you showed my NM "Clines Corners" That was a hoot. It is infamous among us natives.... If you are coming south on US 285 and want to turn onto I40 W...You are FORCED to drive through their parking lot!!!! Now somebody had a political deal with a big-wig somewhere!